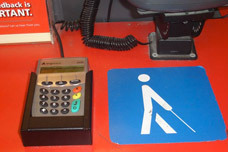 The press release about Safeway Point of Sale Devices was issued as a result of a Settlement Agreement negotiated by Lainey and co-counsel Linda Dardarian on behalf of the American Council of the Blind, the American Foundation for the Blind, and the California Council of the Blind. The full Settlement Agreement is posted in the Point of Sale Settlements Category. Pleasanton, California (October 31, 2006) — In a move praised by state and national blind organizations, Safeway (NYSE:SWY) today announced that it has begun installing equipment to protect the privacy and security of Safeway shoppers with visual impairments. The new devices plug into existing point of sale payment machines and have tactile keys arranged like a standard telephone keypad. They will allow Safeway shoppers who have difficulty reading information on a touchscreen to privately and independently enter their PIN, telephone number, and other confidential information. Safeway operates stores across the country under the banners Safeway, Vons, Pavilions, Randalls, Tom Thumb, Genuardis, Dominicks, Pakn Save Foods and Carrs stores. Every Safeway store in California has already been equipped with several of the devices, and they will be installed across the country over the next 12 months. Todays announcement is the result of collaboration between Safeway and major blindness organizations including the American Foundation for the Blind, American Council of the Blind and the California Council of the Blind. ACB and CCB are membership organizations with thousands of members across the country and in California who will benefit from Safeway’s commitment, said Jeff Thom, President of the CCB. Carl Augusto, President and CEO of the AFB, also praised Safeways announcement: Today’s announcement by Safeway demonstrates the Company’s commitment to the privacy and convenience of its blind and visually impaired customers. Safeway has a long history of supporting our communities and people with disabilities. This decision is one way we can help customers who are blind or visually impaired experience a better shopping experience in every Safeway store throughout the country, said Larree Renda, Safeway Executive Vice President Chief Strategist and Administrative Officer. Safeway Inc. is a Fortune 50 company and one of the largest food and drug retailers in North America based on sales. The company operates 1,767 stores in the United States and Canada and had annual sales of $38.4 billion in 2005. The company’s common stock is traded on the New York Stock Exchange under the symbol SWY. The American Council of the Blind is a national consumer-based advocacy organization working on behalf of blind and visually impaired Americans throughout the country, with members organized through seventy state and special interest affiliates. The California Council of the Blind is the California affiliate of the ACB, and is a statewide membership organization, with 40 local chapters and statewide special interest associations. The ACB and CCB are dedicated to improving the quality of life, equality of opportunity and independence of all people who have visual impairments. Their members and affiliated organizations have a long history of commitment to the advancement of policies and programs which will enhance independence for people who are blind and visually impaired. More information about the ACB and CCB can be found by visiting www.acb.org and www.ccbnet.org. The American Foundation for the Blind (AFB) is a national nonprofit that expands possibilities for people with vision loss. AFB’s priorities include broadening access to technology; elevating the quality of information and tools for the professionals who serve people with vision loss; and promoting independent and healthy living for people with vision loss by providing them and their families with relevant and timely resources. AFB is also proud to house the Helen Keller Archives and honor the over forty years that Helen Keller worked tirelessly with AFB. For more information visit us online. This document is the press release announcing the legal agreement signed by Safeway and the American Council of the Blind (ACB), the American Foundation for the Blind, and the California Council of the Blind (CCB). Safeway agreed to make changes so blind people can pay for things with payment cards and enter their own PIN. Safeway agreed that payment devices in Safeway stores would have keys that a person can feel. All stores owned by Safeway in the U.S. will have a keypad. These stores include Safeway, Vons, Randalls, Tom Thumb, Genuardi’s, Pavilions, Dominick’s, Pak’n Save Foods and Carrs stores. Lainey Feingold and Linda Dardarian were the lawyers for the blind community. No lawsuit was filed. Instead, a formal process known as Structured Negotiations was used.